July 11, 2017, 12:38 p.m. 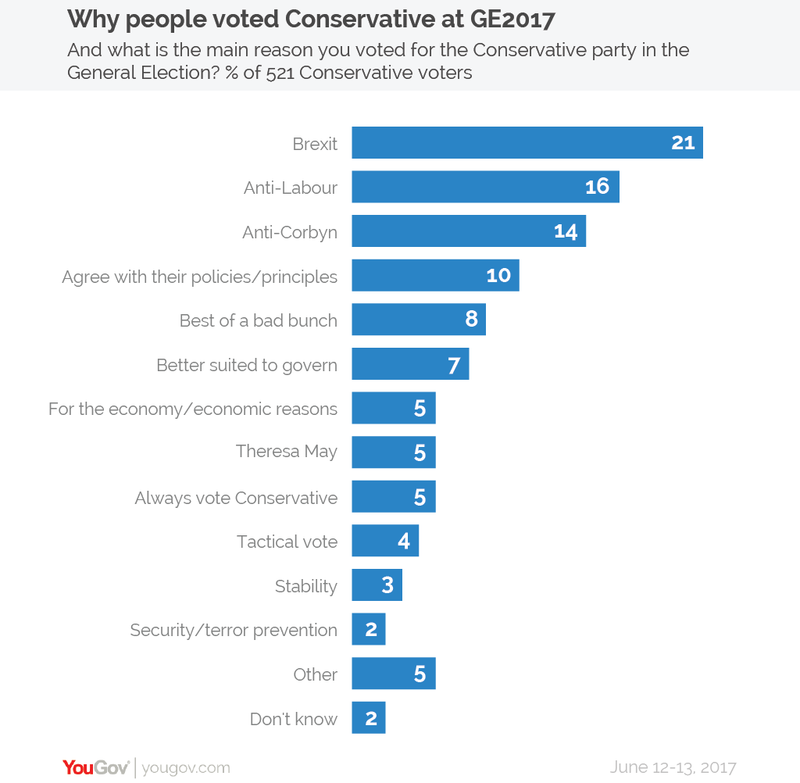 Newly released YouGov research, conducted in the week immediately following last month&apos;s general election, reveals what the most common main reasons that made people decide to back either the Conservatives or Labour. 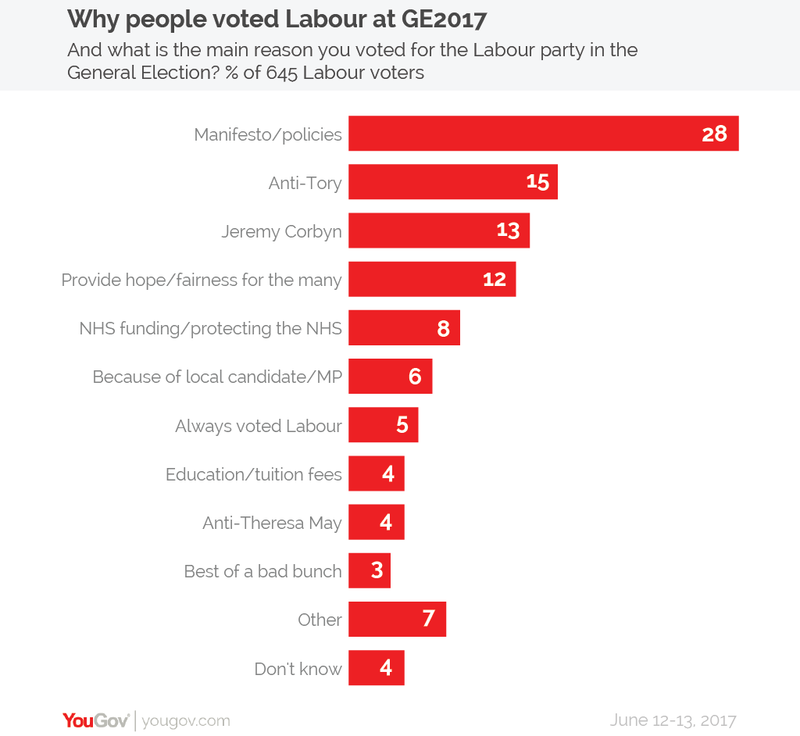 By far the most commonly given main reason (28%) for voting Labour was support for the party’s policies or its manifesto. Anti-Conservative sentiment (15%) was the second most commonly given reason for voting for the party, with a further 4% of Labour voters citing Theresa May specifically as their top motivation for voting for Jeremy Corbyn’s party. The ‘Corbyn effect’ is very much in evidence within the results as well. The Labour leader was the third most commonly cited main reason for voting for the party and young people in particular likely to have backed the party because of him. While overall 13% of Labour voters say that Corbyn was the main reason they cast their ballot for the party, this rose to 24% among 18-24 year olds. Brexit-related motivations topped the list of reasons why people voted Conservative. Just over one in five (21%) of those who cast their ballot for the Tories said that they did so because they thought the party was the best on Brexit. This was a particularly strong motivation among those who hadn’t voted for the party in 2015, at 30%. As it was among Labour voters, dislike for the opposing party was the second most common main reason Conservative voters gave for backing the Tories (16%). However, while only a small proportion of Labour voters cited Theresa May as their main reason for voting Labour, the number of Conservative voters saying they backed the Tories because of Jeremy Corbyn was much higher. At 14%, the opposition leader was the third most commonly cited main reason voters gave for backing the Tories. Given the negative reaction to the Conservative manifesto, it is perhaps not surprising that fewer Conservative voters than Labour voters cited policy reasons as their main reason for backing the party. Whereas policies were the top reason for voting Labour, only 10% of Conservatives voters said the same for their choice of party (the fourth most common reason overall). Similarly, while Corbyn was widely cited as being significant motivation to vote Labour, the same is not true of Theresa May for the Conservatives: only 5% of Tory voters said that the Prime Minister was the main reason they backed the party.